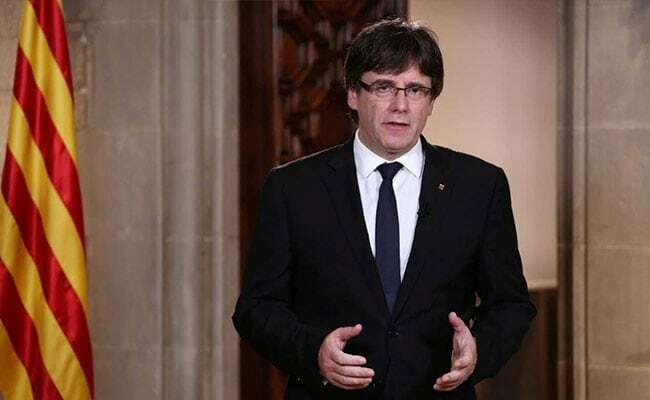 Brussels, Belgium: Catalonia's sacked separatist leader Carles Puigdemont on Monday denounced Spain as an undemocratic country that "unjustly" jailed his colleagues, after he was freed on bail in Belgium. "Released without bail. Our thoughts are with colleagues unjustly imprisoned by a state that is far from democratic norms," Puigdemont said on Twitter hours after the five were released Sunday night. A Spanish judge in Madrid had on Thursday put Puigdemont's deputy and seven other deposed regional ministers behind bars because of a risk they would flee. Belgium's Foreign Minister Didier Reynders insisted it was a legal matter and not one for politicians to deal with, despite recent criticism of Spain from some Flemish separatist members of his own government. "We must let the Belgian and Spanish courts do their work," Reynders told his country's media. Puigdemont's PDeCAT party said Sunday that he had turned himself in to show his "willingness not to flee from the judicial process but to defend himself in a fair and impartial process, which is possible in Belgium, and highly doubtful in Spain". Puigdemont has said he and his colleagues -- Meritxell Serret, Antoni Comin, Lluis Puig and Clara Ponsati -- would cooperate with the Belgian authorities.